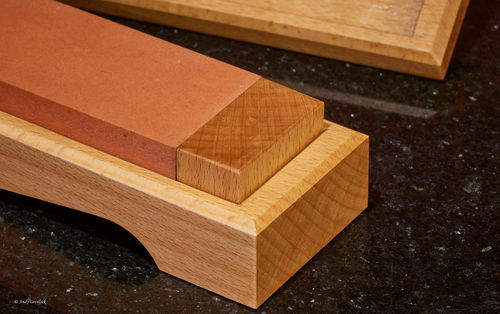 I decided to make a traditional holder for my Norton medium India stone (8”x2”x1”) after watching Bill Carter talking about oilstones on YouTube. After searching the internet for other examples, I merged all the elements that I liked into my design. 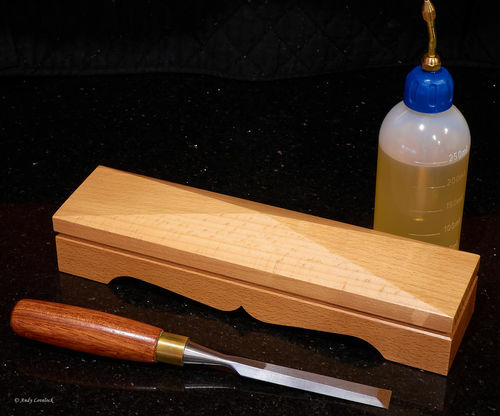 It features a pitched roof, opposing chamfers to seperate the lid from the base, and 1” end grain blocks either end of the oilstone to enable the whole surface of the stone to be used when freehand sharpening. My favourite design detail though is the cupid’s bow cut-out on the underside of the holder. 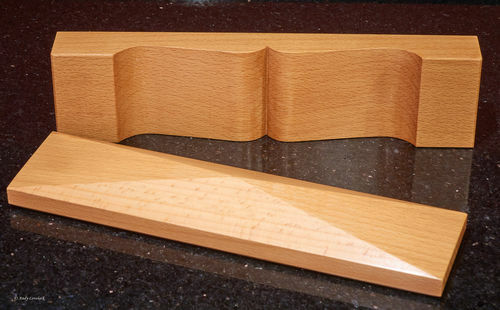 Apart from adding a certain elegance to the piece, it’s function is really to reduce the surface area in contact with whatever it is sitting on so there is less chance of it rocking on an uneven surface. I started with a piece of European beech much like this one crosscut to the correct length. Then using my finger as a fence, I drew a line all the way around to represent the bottom of the pitched roof. I wasn’t working from a drawing, just making it up as I went along. Gripping the wood in the vice, I planed the four sides of the pitched roof with my LN 4 1/2. After that, I turned my attention to the Cupid’s bow detail on the opposite face. I marked this out by folding a sheet of A4 paper in half and drawing half the bow on one side of the paper. I cut this out with a pair of scissors, unfolded the piece of paper and drew around the shape on both sides. Working with the bottom uppermost in the vice, I sawed some relief cuts across the grain and hogged out the waste to within about 1/16” of my line with a bevel-edged chisel. Once the majority of the waste had been removed, I rasped down to my lines and then refined the surface with some P180 sandpaper. Using my finger as a fence, I then drew a line all around to guide my backsaw and ripped the lid from the base. 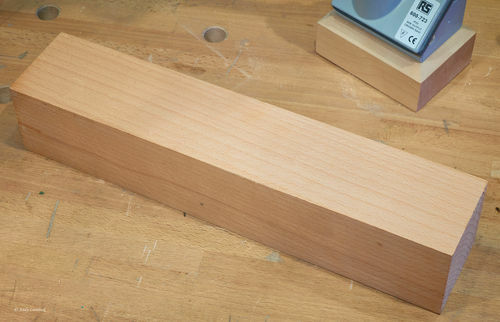 After marking out the mortise in the base with a marking knife, I chopped along the two long sides of the mortise and then hogged out the middle section with a bevel-edged chisel bevel down. 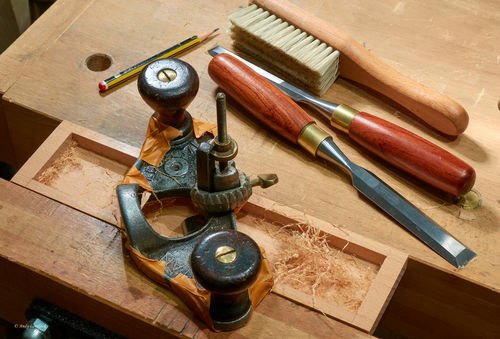 After that I refined the surface with my router plane and pared the two ends of the mortise. I then turned my attention to the mortise in the lid. I calculated that by the time the mortise was at full depth there would only be 3/32” of wood between the bottom of the mortise at the two ends and the roof, so I opted not to chop out the waste with my pigsticker in case I accidentally blew out the top. 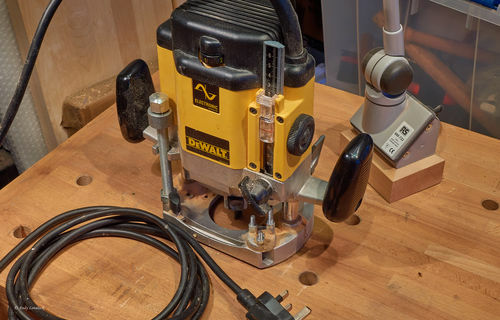 Instead I dusted off my power router and freehanded it to within 1/32” of the mortise walls and then refined the mortise floor with my hand router. The two blocks were then cut and planed until they were a push fit at either end of the mortise. All that was left to do then was plane the chamfers on the underside of the lid and the top of the base with my block plane and break the arrises on all the edges to make the whole thing more tactile. I also added a small chamfer around the mortise in the base so that any oil that ran down the edge of the oilstone would be encouraged back into the stone. The finish is one coat of clear satin varnish thinned 3:1 with pure turpentine sanded back with P240 sandpaper, then another coat of varnish rubbed out with 0000 steel wool. 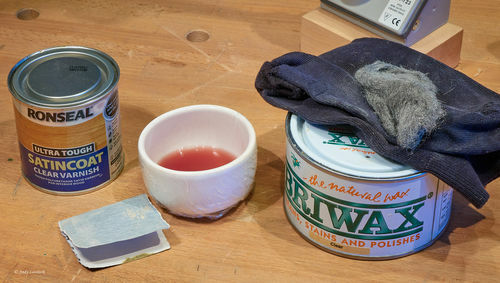 I then gave it a coat of Briwax clear wax and buffed it out with an old sock. All in all a fun weekend project. Thanks for looking. 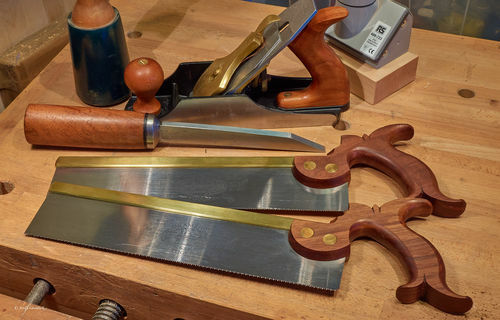 I do have one very important question: Is your router plane wearing leather chaps? HaHa Kenny that’s funny, but hey, whatever works right? 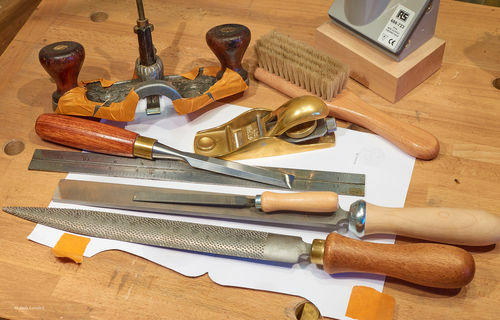 Re my router plane. I have not gotten around to restoring it yet and the underside is a little rough and dirty. I didn’t want it to mark the surface of the wood and didn’t have any suitable wood to make a quick sub-base, so I just covered the underside with some masking tape to protect the wood. Wow! I’ll never show my oilstone box in public now. Beautiful work, Andy! Ahhhh. That makes sense :-) Just never seen masking tape that color. 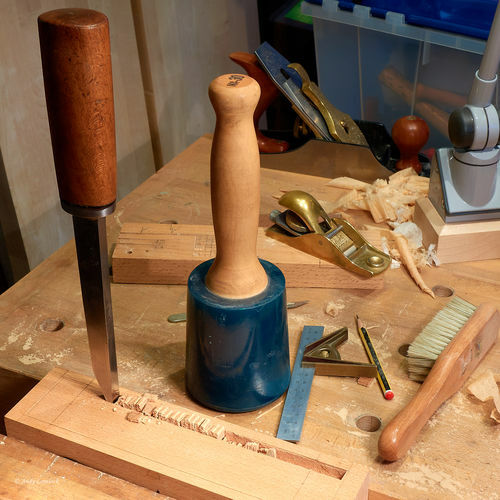 Must be a British thing ;-) It’s quite a lovely example of a router plane. I like those knobs and the general patina. Darn, I thought the Boxes that my Dan’s Arkansas stones came in were nice! Thanks Smitty. Knowing your work though, I doubt it is too shabby. Andre. I was drooling over Dan’s hard black Arkansas stones and really wanted one, but I couldn’t justify the shipping. Then as luck would have it, I saw one on ebay.co.uk which had already been refined with SiC powder to 400 grit on one side and 2000 grit on the other. I couldn’t pull the trigger fast enough. 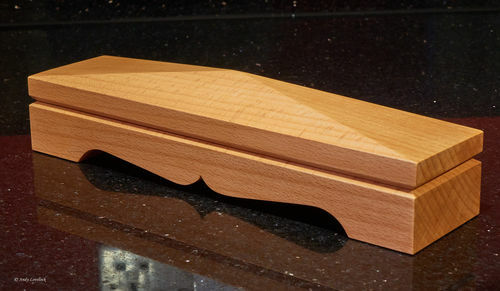 I haven’t got it yet, but I’ll be making a nice box for that too when it arrives. That’s an awfully nice box to hold a rock, Andy. Well done, but aren’t you worried the other stones will be jealous now? There time will come Dave. There time will come. You do really nice work Andy. If you make more for your other stones, you should add some subtle differences so you can tell them apart. Excellent craftsmanship Andy. It sure looks better than the used one from the 1950’s that I inherited from my father. Yours looks too nice to use. Duck – I’ll be sure to do that. John – Maybe but yours is more personal since it comes from your father. I have a couple of tools from my grandfather which I cherish. Andy that’s pro work right there.